Apparently back in his day motion was not only a big deal but it was also apparently out of control and needed to have some laws written to govern it. 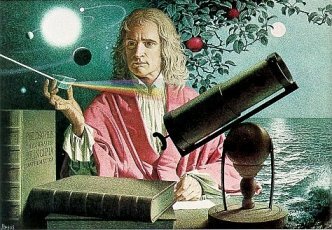 If I lived back then I would have been mad about apples falling on my head as well and probably would have come up with some pretty awesome laws of my own. Big Data is kind of old news. How old? Even I jumped on the bandwagon all the way back in September of 2016. In this post I’m not going to talk about Big Data instead as the heading suggests I’m going to write about BIGger DATA. Marketing slides would say that Qlik has 10 points of integration with Cloudera. Woo-hoo. You can actually get the value out of all that Big Data with Qlik. But those of you reading this blog aren’t novices. You already know that Qlik is a data ingesting beast and already knew that Big Data is simply another source of data. Qlik’s Associative Model will gladly allow you to associative your 0’s and 1’s from cocktail napkins, spreadsheets, flat files, databases, EDW’s and of course Big Data sources. Kind of crazy that I can actually make light of that point, but let’s face we already know that. Nothing new to look at there. Where I’m going today is beyond even that. I’m suggesting that the data Cloudera collects about your ingestion of Big Data is also a source of meaningful data which is now just sitting at rest but can and should be visualized so you can get value out of it as well. In other words BIGger DATA. Don’t laugh to hard but my use of the uppercase when using the word REST isn’t accidental. It’s intentional. What I’m driving at this post is using the Qlik REST data connector to take advantage of all of the data sitting there, at rest, about what you are doing with your Big Data. Sneaky huh??? That’s how I roll. Let me lay the ground work for what I’m talking about. 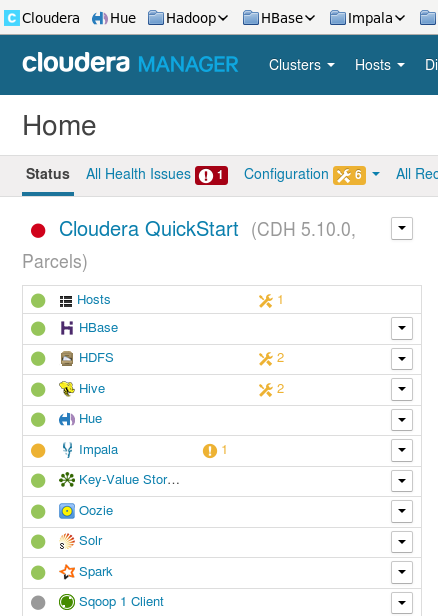 Cloudera provides a nice Cloudera Manager tool that you can utilize to see a lot of different things about your implementation. I can see what’s going across the system. I can also drill into different systems to see what’s going on with them specifically. No big deal you say? Happy to click around and hunt and peck to find everything are you? Well how would you find any issues in any of the systems that have to do with memory or see their history? Well in Qlik I would simply use the Smart Search feature to find anything that has to do with the term “memory” but that’s just me. What about the metadata collected about the queries that are used to pull the Big Data? Doesn’t have value? OF COURSE IT DOES so you know I want to visualize that as well. Not only can we show you which queries were fired and how many times they were fired, we can show a distribution plot of how long the queries took each time. Glad I was the guy who selected “Hello World” in 18 ms and not 5.5 minutes. Hate to be that guy. More importantly I’d hate to be the team that is just leaving all this data lay at rest on your system. If you don’t understand why… see my 3 Laws of Data above. I’d like to begin this section by sharing that all of the real work in coding that you will see was done by my buddy, and Cloudera implementation stud David Frericks. 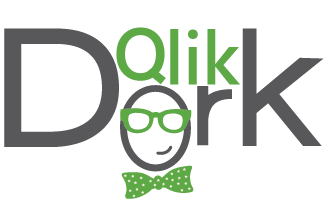 Yes, there are others at Qlik that are bigger data dorks than I. And David is the guy the Qlik Dork goes to. Did you even know that Cloudera had a fully supported set of REST API’s that could be used to pull this wonderful data that is only resting as of now? Guessing the answer is no or it would be redundant to write the question. You can check it all out right here. Let me walk you through a very simple REST API call. Let’s say we want to get all of the Impala queries that were run on the system. There is a REST API for that. We would implement that call using the Qlik Rest Connector like so. 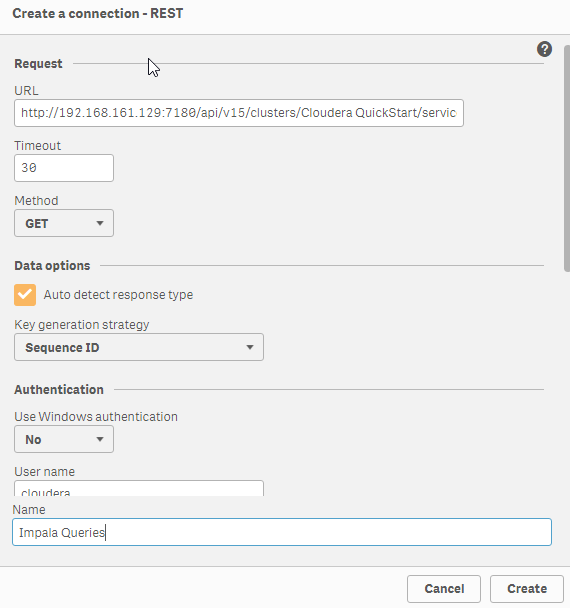 Notice that I’ve filled in my Cloudera system IP address and put my Cloudera system credentials in. 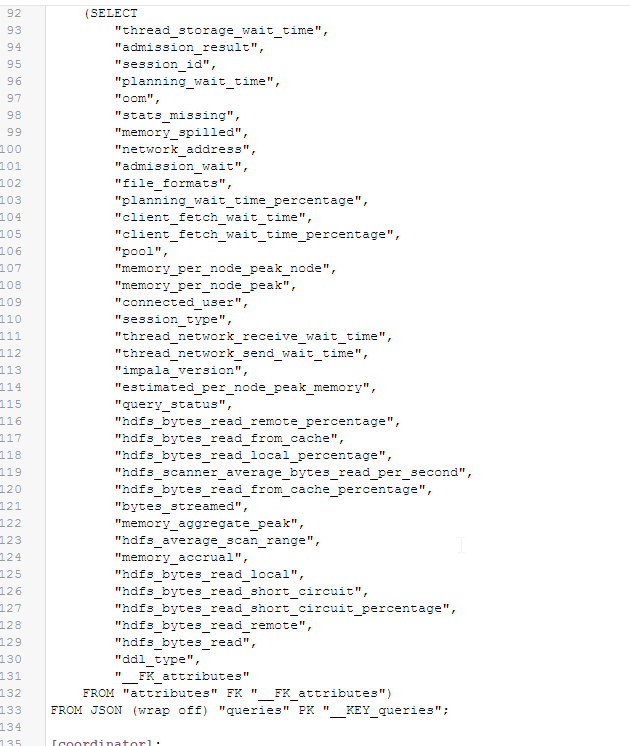 That will then allow me to see what that REST API call will surface in terms of data. I say heck yeah, go get that for me … and boom it loads that data. It’s important to understand what’s happening behind the scenes at this point. Script is written that will execute and process that call. Phooey you say? TMI you say? No my friends here is where the rubber meets the road … with script you can overcome any kind of REST API barriers that may exist with Cloudera or with others … say those pesky times when they implement a MAXIMUM number of rows being returned. Qlik can loop and get all of the rows for you. But wait there’s more. What about those times where you have 1 REST API call that returns some key information and you then need to go get the details using another REST API call? Or when you have multiple systems implemented and want to get all of the information about the systems, the calls that were fired, their history, their blah-blah-blah-blah. 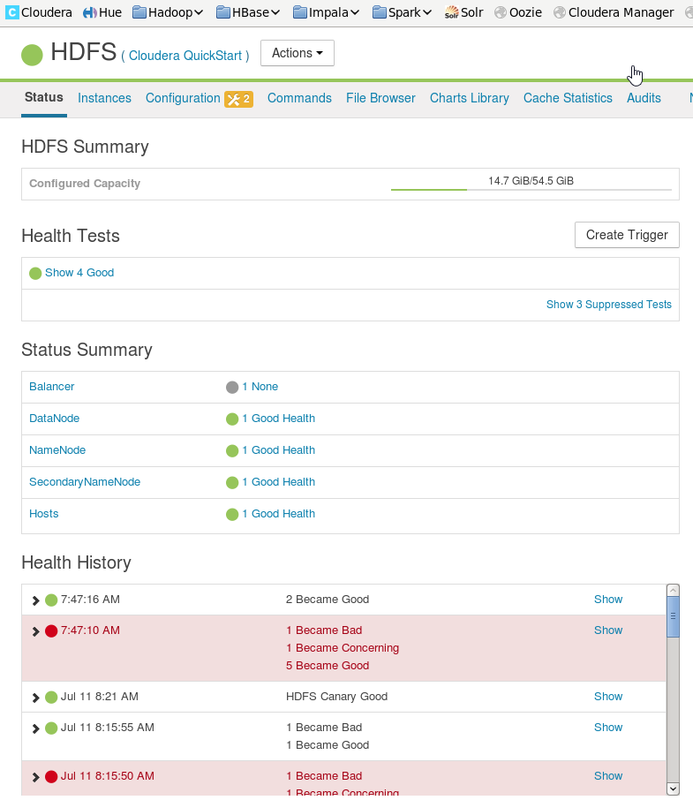 Yeah Qlik let’s you do all of that because of it’s ability to do the ETL on the fly. When I started the section with a shout out to my friend David Frericks it wasn’t in jest. Dude provided a serious baseline of work in making the Cloudera REST API’s fly information and has produced some great work. “Hope isn’t a Strategy.” I read that recently in a book called “Wintality” by Baylor Barbee and that it was an awesome quote to summarize what I see happening right now in most people when it comes to big data. Lot’s of HOPE. They are hoping that the time will come when they will learn, understand, begin diving into “Big Data.” I’m assuming that you are reading this post because you are the kind that is more action oriented and you have or are formulating you strategy for visualizing your Big Data and hopefully now your Big’ger’ Data as I’ve laid it out for you. Be sure to check out http://cloudera.qlik.com/ to see some great examples of how Qlik brings Big Data to life. This entry was posted in Data Science / Big Data, Self Service and tagged Big Data, Bigger Data, Cloudera, metadata, REST API, Self Service, Visualize. Bookmark the permalink.